This 5-days trek from Faro to the south of Portugal will make you discover the whole mountain range of the Algarve. You will crisscross the Algarve from east to west to the beautiful Costa Vicentina in the south-west of the country. 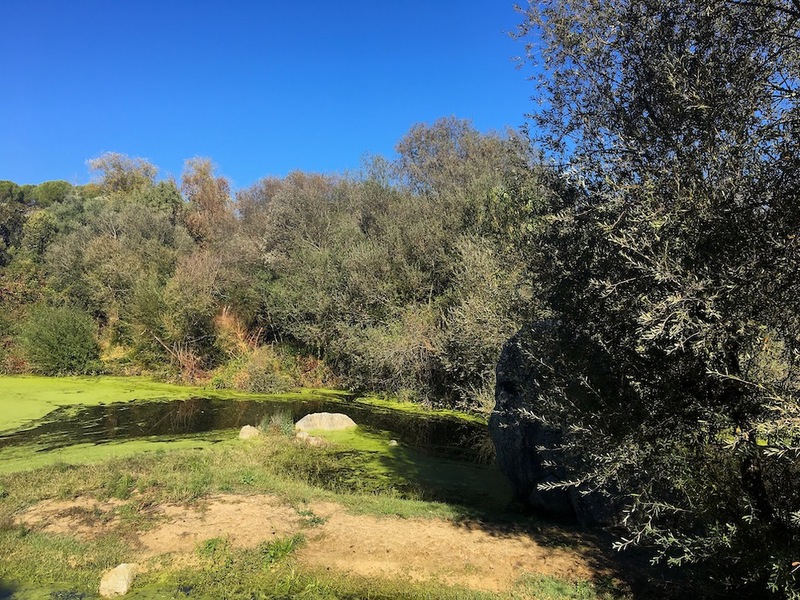 It will allow you to discover the rugged and wild relief of the south of Portugal by the paths through the maquis and forests of fir and eucalyptus trees. Approximately 250 km in 5 days (98% of trails and paths) with GPS provided. DAY 1. Arrival in Faro. Meet at Faro airport and transfer to the hotel *** with swimming pool in Sao Bras de Alportel. Briefing and dinner. Our first day will allow you to discover the Algarve massif and beautiful river crossings. Picnic break. Superb afternoon with crest trails allowing us to admire the Atlantic coast. Dinner and overnight in *** hotel in Sao Bras de Alportel. DAY 3. Sao Bras de Alportel - Alte: 48 km - VMC: 1250m. - 5 to 7 hours of riding For this second day, we will pass in the western massif of the Algarve, but the relief will always remain so steep. Picnic in the village of Alganduro. The day will be a succession of climbs and beautiful descents mainly in forests of green oaks. End of the day in Alte in the hotel ***. DAY 4. Alte - Caldas de Monchique: 55 km - VMC: 1180m. - 5 to 7 hours of riding Our biggest day will start with easy paths to reach the beautiful banks of the Rio Arade dam. Lunch break on the banks of the lake. We will have a sporty afternoon with a positive elevation of 750 m. We have reached our hotel****, located in the eucalyptus forest, thermal spa of Caldas de Monchique. DAY 5. Caldas de Monchique - Aljezur: 45 km - VMC: 980m. - 4 to 6 hours of riding We will go up to Foia by minibus, the highest point of the 891m raid where we can admire the Algarve mountains and the ocean on a clear day. Then start a long descent in the eucalyptus forests, go back to Marmelete for the picnic break. 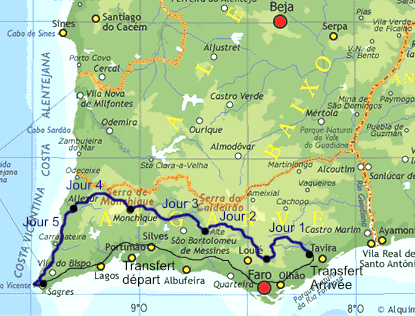 We will continue to drive in the dense forests of Serra de Monchique before reaching the coastal plain at Aljezur. Last climb before reaching our hotel *** located 2 km from the ocean. DAY 6. Aljezur - Vila do Bispo: 44 km - VMC: 840m. - 4 to 6 hours of riding The last stage is 100% Costa Vicentina. We will pass on the wild Praia do Canal. Lunch break near Praia da Bordeira. On the way back we can admire the beautiful coast Vicentina very specific geology, cliffs and coves surfers. This stage will end on the beach of Cordoama, or Cape Sao Vincente the southwestern tip of Portugal according to your choice. In the afternoon we will transfer the group to the hotel*** in Faro. After breakfast, you will be free to continue your stay in Algarve or take your return flight from Faro Airport.